Bavaria has always been a favorite of stamp collectors. First issuing stamps in 1849, the Kingdom of Bavaria was only the ninth country in the world to use postage stamps. 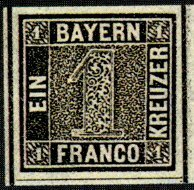 Bavaria was also the first of the perennially popular German States to begin stamp production. Bavaria was an independent and influential European entity from the time of Charlemagne, through the Middle Ages, and into relatively modern times when in 1870 it was forced to join the German Empire. It was bordered by Wuerttemberg, Saxony, Bohemia, and Austria. 1 Kreuzer -- deep black -- local. 3 Kreuzer -- pale blue -- up to 55 miles. 6 Kreuzer -- yellow brown -- 55+ miles. The designs of the first stamps were very basic with bold numerals forming the basis of the design. The basic nature of the designs is generally attributed to a political and social conservatism. Other countries such as England, France, and the United States, had begun stamp production with designs based on portraits of individuals. The Bavaria designs were more reminiscent of the stamps of Brazil. Bavarian stamps would not feature a portrait until the 1911 issues commemorating the 90th birthday of Prince Regent Luitpold. Bavaria entered an agreement with Austria, Prussia, and Saxony in April 1850 and a 9 kr stamp was issued for distances of greater than 92 miles. In 1854 an 18 kr value was added to cover double rates. Additional rates were added over time. Although there were only a limited number of designs issued, a rich number a varieties exist for the specialized collector. Plate, paper and color variations are all collected, and there is a particularly rich field of cancels. Each city in Bavaria had an individual number cancellation and about 2,000 have been identified. As the German Empire slowly absorbed the group of countries history calls the German States, Bavaria reached another philatelic distinction. Not only was it the first of the States to produce stamps, it was also the last to operate an independent post office. 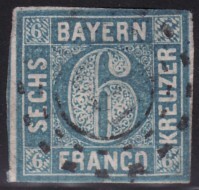 In 1918 all existing Bavarian postage was overprinted to show Bavaria had become a republic. In 1920 the regular issues of that year were overprinted "Deutches Reich" when the Bavaria postal system was absorbed into Germany's.